Today’s Italian Farro Salad is here to prepare us for one of the most important seasons of the year: POTLUCK SEASON. 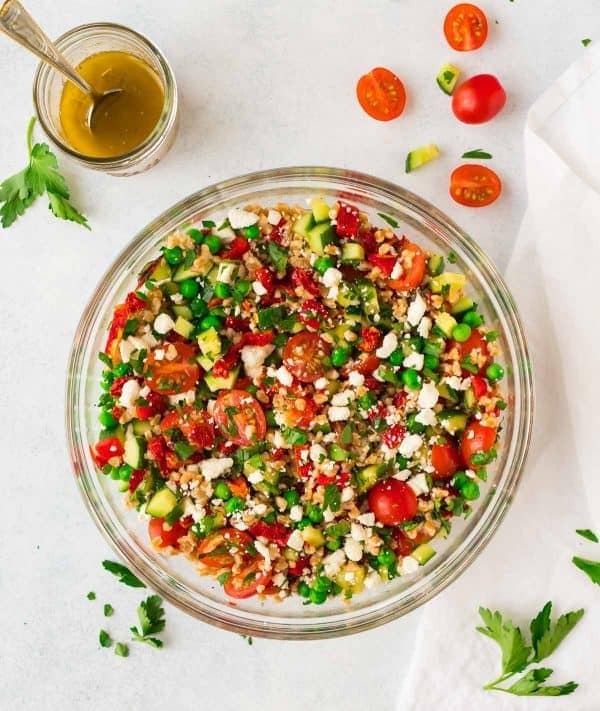 Easy to prep in advance, packed with colorful veggies and creamy feta, and topped with a light, zippy vinaigrette, this big bowl of mealtime sunshine is ready for evening cookouts and afternoon barbecues.…or, in my current case, busy weeknights huddled beneath a blanket. This recipe is sponsored by Bob’s Red Mill. Since warm outdoor barbecue weather has been heartbreakingly slow to arrive this year (and we have 12 inches of unwelcome April snow on the ground as this post goes to press), when the sun does finally grace us with her presence, we best be ready. Do you know where your flip flops are? Who has the sunscreen? Can someone hose out the cooler? And, most importantly of all, what are we going to EAT at our first outdoor feast??? My vote: Italian Farro Salad! 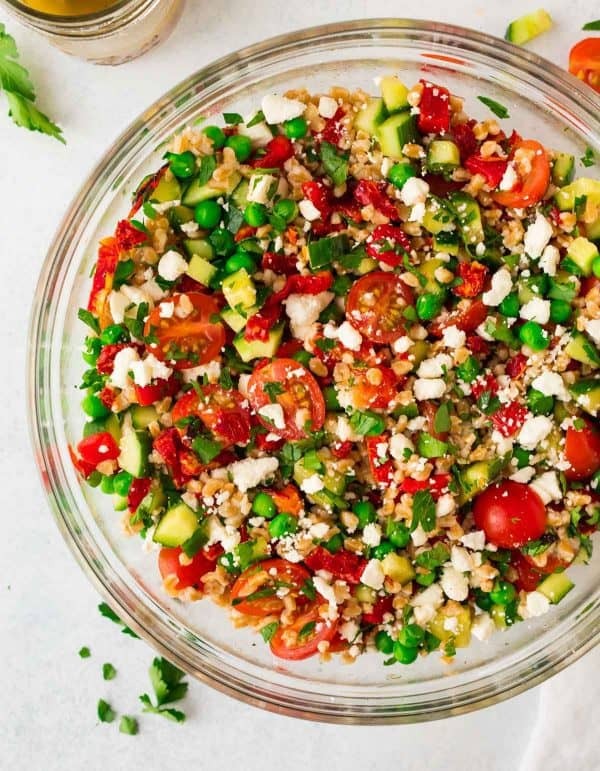 This Italian Farro Salad with feta is the kind of recipe that was tailor made for gatherings with friends and outdoor barbecues. It can be prepped ahead and tastes great at room temperature, it pairs perfectly alongside anything you’ll pull off the grill, and it yields enough for a crowd. In the event of leftovers, this farro salad can also last in the refrigerator for several days, making it an excellent candidate for meal prep lunches and dinners. I had the first round of it for lunch, and the next two nights, Ben and I ate it as a healthy side dish with our dinner. If you’ve never had farro, you are in for a delight. Farro is a type of ancient wheat that’s still very popular in Italian cuisine. It’s hearty and pleasantly chewy, and it has a rich, nutty flavor. Farro’s flavor and texture makes it perfect for recipes that range from casseroles and pilafs (try swapping it for rice for a change of pace) to soups and stew to my favorite of all, satisfying grain-based salads like today’s recipe. 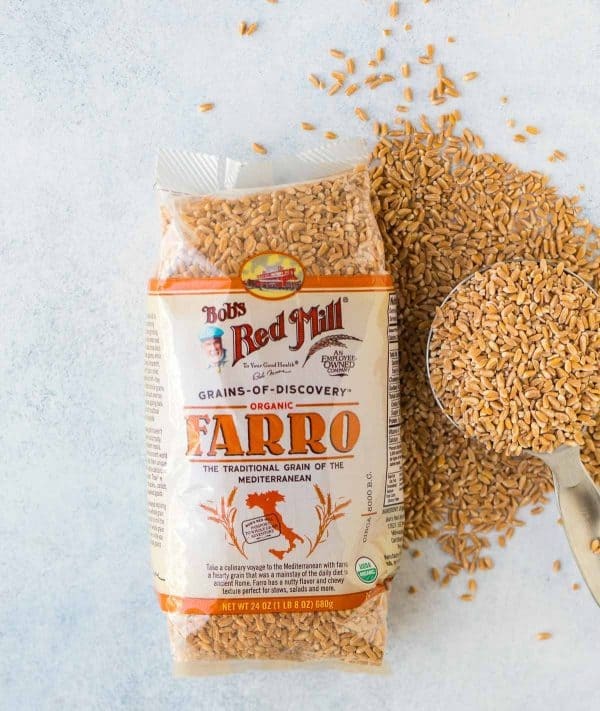 I choose to get my farro from Bob’s Red Mill, because I trust the quality of their sourcing and processing, and because it always cooks perfectly and tastes fantastic. No mushy, bland farro here! A few years ago, I had the pleasure of visiting the Bob’s Red Mill headquarters (and to meet Bob—see HERE), and I was so impressed by the company. Everything about Bob’s production focuses on maintaining the maximum possible nutritional value of its products, even if that comes at the expense of profit. Faster production can mean more goods to sell, but it often overworks the grains and detracts from their nutritional content. With Bob’s farro, and many of their other products, I feel confident that I’m really getting the best, both in terms of taste and overall health benefits. If you are looking for more tasty ways to use that bag of farro, I have a farro salad for every season for you! Be sure to try this Strawberry Farro Salad while berries are in their prime. Once summer hits, it’s time for this Super Summer Farro and Kale Salad and this Southwest Farro Salad. Looking for a fall farro salad or winter farro salad? This Butternut Squash Farro Salad with Cranberries has my eye! For today and for the next few months, however, I am all about this Italian Farro Salad. Since this farro salad recipe uses a blend of tangy sundried tomatoes (which are always available), fresh cucumbers and cherry tomatoes (which taste quite good year round), and frozen peas (a freezer staple—you can swap fresh if you like, but I find frozen to be just as tasty and so much more convenient), you don’t need to wait for summer produce to hit the stands to enjoy this recipe. Try Italian Farro Salad for your next party, a healthy lunch this week, or for a simple dinner side. As always, if you do make the recipe, I’d love to hear how it turns out! On its own, this farro salad works well for a filling, healthy lunch. If you’d like to up the protein factor while keeping the salad vegetarian, you can mix in drained, rinsed low-sodium chickpeas. A grilled burger like these protein-packed Black Bean Vegan Burgers or these on-theme Italian Turkey Burgers would be perfect. Top the farro salad with cooked shredded chicken (I recommend this easy method for how to cook shredded chicken), grilled chicken, or shrimp. Serve alongside simply baked fish (how we had ours!). Italian Farro Salad with feta, fresh tomatoes, veggies, and a bright red wine vinaigrette. Delicious, filling vegetarian recipe that’s perfect for healthy meal prep, light lunches, or a side dish with dinner. Tastes great leftover and at room temperature, so it’s a perfect potluck and barbecue side dish recipe too! Rinse and drain farro, then cook according to package instructions. Transfer to a large mixing or serving bowl. While the farro cooks, prepare the dressing: In a small bowl or large measuring cup, whisk together the olive oil, red wine vinegar, Dijon, honey, oregano, salt, and pepper until evenly blended. Pour half of the dressing over the warm farro and sprinkle with 1/4 teaspoon salt. Toss to coat. 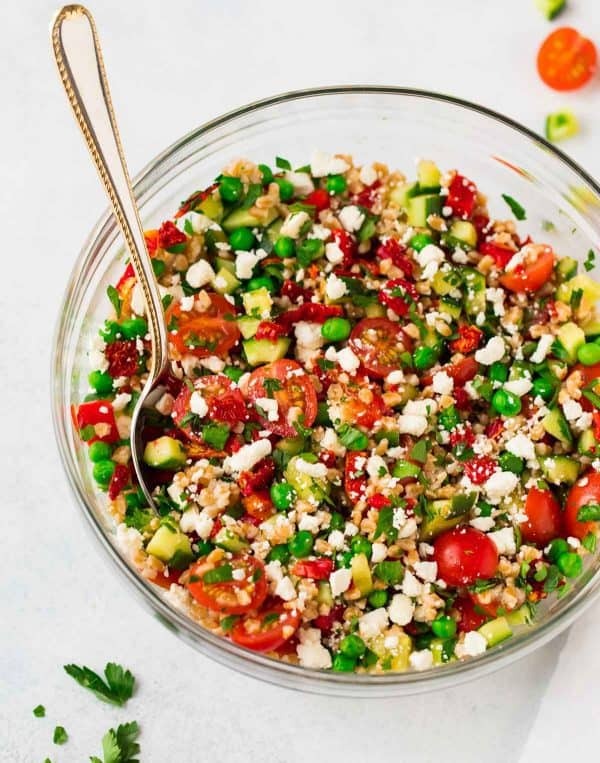 Add all of the remaining ingredients to the bowl except for the feta: sundried tomatoes, cucumber, roasted red pepper, cherry tomatoes, peas, and parsley. Toss to coat. Taste and add as much of the remaining dressing as you like. Sprinkle with feta, lightly toss again, then season with salt and pepper to taste. Serve cold or at room temperature. *I liked to use dried packaged sundried tomatoes instead of oil packed, as I find the salad has enough oil with the dressing. If you prefer sundried tomatoes in olive oil, you can swap them here. To rehydrate (you may or may not need to do this; if the sundried tomatoes seem moist and plump, you can skip this step): Place in a small bowl and cover with boiling water. Let rest a few minutes, then drain and use as directed. Store leftovers in the refrigerator for up to 3 days. If you won't be eating all the salad right away, I recommend reserving some of the dressing to moisten and revive the leftovers. If you do use all of it, you can also brighten the leftovers up with a squeeze of fresh lemon juice. To make vegan: Omit the feta cheese; replace the honey in the dressing with light agave or simple syrup. To make gluten free: Replace the farro (which is not gluten free) with a different grain such as quinoa or brown rice. I am sharing this post in partnership with Bob’s Red Mill. As always, all opinions are my own. Thanks for supporting the brands and companies that make it possible for me to continue to create quality content for you! For more healthy recipe inspiration, coupons, or to find a store that carries Bob’s Red Mill products near you, visit bobsredmill.com. I simply cannot wait for grilling season! We got 15″ of snow here in Minneapolis and it seems like spring/summer will never get here but this salad is giving me hope! I can’t wait either! Just think about warm weather and this salad to get you through those snow piles! This looks amazing…only question I have is what can I substitute for the Feta?…not a fan of that ? Hi Pennie, you could try queso fresco (a crumbly Mexican cheese that’s more mild than feta) or cubed mozzarella! I hope you enjoy the salad. hey girl- this salad looks really good! I totally need to make this weeknight dinners when I am trying to be healthy. The flavors sound amazing…I LOVE feta! Great recipe! Erin, Thanks for introducing me to farro! I can’t believe I made a fabulous dish with a food I’ve never eaten before! I used garbonzo beans instead of peas and served it as a side dish to a fish recipe I got from you in the past. Your recipes are amazing and always easy enough to make me think I can actually cook! Made this last night and then discovered I didn’t have any peas. Added them today and stirred everything together again with a little reserved dressing. aMAZING! It’s easy to make, the taste and texture are great, and I really appreciate the abundance of veggies in this dish. It’s a keeper for sure, especially for my lunch time rotation. Wanda, YAY!! I’m so pleased to hear that this is a keeper recipe for you. Thank you so much for trying it and taking time to leave this wonderful review. It means so much! Hi Erin, this is the first time I used farro and I love it. Your salad was great with lots of flavor. And it looks so colorful too. Can’t wait to have leftovers tomorrow. Hi Coleen! Thank you so much for the positive feedback! I am thrilled you tried something new and enjoyed it :) Savor those leftovers!! Yum! I made this salad about 2 months ago for a church potluck. It’s so similar to a Mediterranean orzo salad I usually being, that gets demolished I figured people love this one too. Boy was I wrong, I had a ton left over. I’m thinking that people had no clue what farro was, so they didn’t eat any. Their mistake!! The only problem we had with this salad was that it was a little too dry the next day. However, a quick splash of more dressing solved that issue!! Great salad Erin!! I’ll make it again soon. Juli, the WHOLE WORLD needs to know about farro (I agree, it is so good!) Regardless, I’m glad that you enjoyed it, and that the extra dressing made the leftovers just right. Thanks for trying something new! My kids were all about the leftovers!! This salad is that good!! I agree about the whole needing to know about farro. It’s somme great stuff! If you’re not gluten free. I’m gonna try this salad with quinoa for my GF friends! I am obsessed with this salad. I made it a second time and threw in goat cheese to try something different. Delightful!! YAY, Holli! This makes me so happy to hear, and goat cheese sounds AMAZING! This salad was a 3.5/5 stars until I added about 1/3 cup of red onion. Now it’s 5/5! Delicious and got rave reviews from co-workers! Colorful, nutritious, tasty, refreshing, easy, quick. What more could you want? This was my first time making this salad and I would definitely make it again and again – with the onion, of course! Recipe is a keeper! Michelle, I am so glad you enjoyed it and were able to adjust it to be just right for your tastes too! Steph, I am so so happy to hear how much you all enjoyed it, thank you!! This is absolutely delicious! I forgot to pick up peas, but I didn’t miss them. The dressing is wonderful and the vibrant colors and freshness of this dish make me so happy! Thank you for the excellent recipe. Connie, I’m glad to hear the recipe was a winner! Thank you for taking the time to leave this awesome review! Made this last night after trying to come up with a new way to use my favourite grain – FARRO! I didn’t change a thing other then triple the recipe for my hungry hubby, and used this as a meal prep meal! I didn’t have any roasted peppers prepared, so I made my own by broiling 3 red/orange/yellow in the oven. Loved the sun dried tomato addition as well, it really gave the salad a boost. Eryn, I’m so glad to hear this salad is a hit. Thanks for taking the time to share this review!